Fame! The Musical follows a group of performance arts students through their formative years at the “Fame” high school, and is full of vivid characters, energetic dance numbers, and show-stopping songs. Largely an ensemble piece, it’s the perfect choice and platform to allow Edinburgh University Footlights’ members to present their considerable talents as actors and singers, and there are plenty of individual noteworthy performances throughout. Mimi Joffroy demonstrates all the ingredients of a stellar leading lady as Carmen, most evident in the goosebump-inducing In L.A.; Matt Galloway delivers a laugh a line as the charismatic Joe, and dance captain Connie McFarlane proves she’s a genuine triple threat in the gospel-tinged Mabel’s Prayer. Alice Hoult and Adam Makepeace show great chemistry as romantic leads Serena and Nick, and Mhairi Goodwin serves up a killer belt as Miss Sherman in These Are My Children. Liam Bradbury never quite convinces he’s actually a hip-hop dancer as Jack, though comes into his own during the character’s signature song Dancing on the Sidewalk. Yet given all this obvious talent, what holds this production back is being able to effectively embrace the script’s very bitty nature, made up of lots of short scenes taking place over a number of years. EU Footlights’ simple set proves very constraining to this end, often dragging the action to the back of stage, while there’s precious little to link each part and show progression over time. There are pleasing teases of getting it right during Think of Meryl Streep, as action continues behind the singer, so it’s slightly frustrating not to see more creativity in the presentation of each scene throughout to make it feel like one cohesive piece. Additionally, Fame! is a show that is chock-full of dancing, requiring much more from a cast and choreographer than your average production. The company certainly give it their all during this performance and there are some wonderful moments during the dances (especially some of the daring lifts! ), but there’s also a scrappiness to the performance – particularly in the ballet sequences – which, although charming at times, more often detracts from a lot of the other great things happening on stage. Some extra time spent in brushing these up would go a long way to adding to the quality of this production. Overall, Fame! is a feel-good show with plenty to enjoy, and EU Footlights should be very proud of the job they’ve done with it. Though one can’t help but feel that we ain’t see the best of them yet. Visit the Church Hill Theatre archive. In my experience, condensed versions of musicals generally go one of two ways: they either trim the fat from the full version and present a slick and sizzling highlights reel (as in EUSOG’s Spring Awakening last year), or they come across as a slightly misshapen patchwork quilt of musical moments. Unfortunately, Edinburgh University Footlights’ production of Sister Act falls into the latter camp. However, some of its musical moments are really rather magical. We all know the story of the show: aspiring and audacious nightclub singer Deloris Van Cartier has to hide away with a group of nuns for her own protection, and in so doing transforms their choir into a team of sensational songstresses. Sarah Couper certainly gives it her all as Deloris, with hugely likeable sass and personality, which is more than capably offset by Tayla Steinberg’s harsh but witty Mother Superior. It’s Alice Hoult as the timid Sister Mary Robert who vocally steals the show though, with a flawless rendition of the rousing The Life I Never Led. A masterclass in control, it’s a shame some of the other numbers lack the overall quality and power of this one: it really stands out as something special. Yet when this production hits the sweet spot, it really does soar. The Raise Your Voice scene in particular is energetic, harmonic and full of the gospel spirit this whole show embodies. Caili Crow’s choreography is stylish, intricate and very deftly delivered, and for a few minutes here and there the performance really sparkles. The main strength of this production overall is comedic characterisation, and director Ansley Clark has done a great job in bringing the best out of each individual throughout the performance. Nicola Frier is a revelation as the excitable Sister Mary Patrick, delivering laughs aplenty with every utterance; Adam Makepeace is a wonderfully dorky TJ; and Mhairi Goodwin brings a whole new level of vibrancy to Sister Mary Lazarus that I didn’t think was possible. This production is quite hit and miss though, making it difficult to stay fully engaged with it throughout. While I won’t go into details of the technical issues which unfortunately blighted this production, other factors such as the (at times) awkward staging, the very choppy nature of lots of different quick scenes, and lack of palpable tension in the big moments all detract from what has the potential to be a really outstanding show. It all feels a little rushed and a bit too rough around the edges. This a very commendable effort from the cast and company, but perhaps slightly too ambitious too pull off. In large part thanks to a popular American TV series from the 00s, being in a show choir has become a lot more socially acceptable – even “cool” in some circles – in recent years, so it was great to see a packed house for Edinburgh University Footlights’ latest show, and a stage full of diverse young people who love being there. In A Step In Time the group demonstrates all the qualities that make show choirs eminently lovable: fun renditions of upbeat popular tunes, killer vocals, show-stopping choreography and smiles big enough to fill the room. But behind all the glitter and grapevines, did the performance itself deliver a knock-out punch? In my opinion, not quite. Opening number Step in Time set the scene well as a lively and energetic introduction to the night’s proceedings with some clever, subtle changes in lyrics and arrangement to make the song feel like the choir’s own. Accompanied by full-on intricate choreography, it says something about the fitness and dedication of the group that they were even able to breathe for the next ten minutes, let alone perform song after song, complete with dance routines. For me, it was a shame there was significantly more focus on the “show” rather than the “choir” elements of the performance, with complex choreography and numerous costume changes detracting from the vocals throughout. Harmonies and power were often lost in the frantic flailing of arms and apparel, and what remained was at times imprecise and unnecessary. The flow of the performance was also quite stilted, with some uncomfortable lengthy pauses between songs, hindering the overall enjoyment of the night. However, it was in the simpler and more stripped backed numbers where the group really excelled: the 90s medley, Seasons of Love and the 00s medley in the second half really showcased the strength and depth of the choir’s vocal talents, and it’s a shame we didn’t see more consistent top quality vocals and arrangements like these from the choir as a whole throughout the show. There were also some beautiful stand-out solo and small group performances (specifically Believe, She Used To Be Mine and I Know it’s Today) which highlighted some really gorgeous individual voices. I would have preferred more quality over quantity in terms of the choreography, using it cleverly in specific numbers to give wow-factor, with greater focus on the basics of group singing as the overarching emphasis. Overall I think the group tried to do too much too often, which left the lily not just gilded, but smothered in cream and cherries too. Still, it was an entertaining performance from a talented bunch of young people, that was, on the whole, very enjoyable. I look forward to the next one. 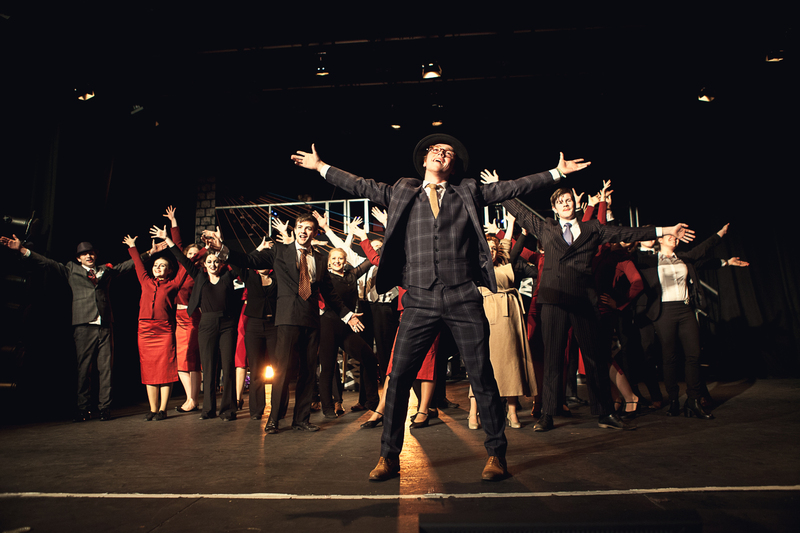 Guys & Dolls has a special place in my heart, as it was my first footlights show at university some ten years ago. 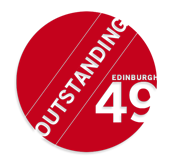 I remember the hours I spent rehearsing the gruelling dance sequences and complex harmonies, so I was amazed at how well this cast of Edinburgh University students delivered on both counts. The scene in Havana was perhaps a bit ambitious choreographically and could have contained more progression and showpiece moments, but overall the chorus numbers were performed with great vim and pizazz. The stars of show also delivered with aplomb. Ellie Millar as Sgt Sarah Brown had a voice that danced with the purity and clarity worthy of a leading lady, and her rendition of If I Were a Bell struck a fine balance between comedy and stunning vocal range. Oliver Barker oozed with masculinity and presence as Sky Masterson, while Tom Whiston brought a likeable naivety to Nathan Detroit. Mae Hearons was a delight as Miss Adelaide, and really came into her own in act two with a string of dazzling songs. While the vocals across the board during the first half of the production were a little shaky (I’ll put it down to nerves in front of a packed house early in the run), the second half was littered with many a five-star moment, including Adelaide’s moving second lament, a Sinatra-esque Luck Be a Lady, and the precise and energetic Crapshooters Ballet. However, for me, the vocal performance of the night was by Adam Makepeace as Nicely Nicely Johnson, who delivered a rousing and extremely capable rendition of the tricky Sit Down You’re Rockin’ the Boat. A special mention also to Tilly Bartholomew as Arvide Abernathy, who was charming and note perfect in More I Cannot Wish You, and displayed great tenderness and well-placed comedy throughout the performance. This show aimed to take the original musical back to its roots in the 1930s, and some nice touches in Grace Dickson’s choreography – particularly in Take Back Your Mink – felt very reminiscent of that golden era. Director Lucy Evans also cast some females in traditionally male roles as a nod to some of the period’s female gangsters, and, while a brave choice, I felt Evans could have gone one step further in allowing these characters to explore their femininity and interact with the male characters as women, rather than women pretending to be men. Still, Lila Pitcher was commanding as Chicago big-shot Big Jule in an interesting gender twist. Yet for all the great work by the performers and band (who never faltered under Steven Segaud’s masterful musical direction), I was a little disappointed in the production values of the set and costumes. These elements were quite basic, and with a bit more attention could have added much more “wow factor” and style to be sympathetic to the show’s overall creative aims and chosen time period. All-in-all, a feel-good romp of a show. Don’t gamble – buy a ticket.